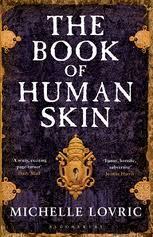 If you are looking for a good summer read, try The Book of Human Skin by Michelle Lovric. I have just finished reading it and it is fabulous. The book starts in the late 1700s and is set in Italy and Peru. We have five narrators to talk us through a fantastic tale that involves a valet, brother and sister (in which the brother attempts to murder the sister to protect his inheritance), a doctor and a Peruvian nun. It takes a little work dealing with all the different view points, but the effect is marvellously different and you will soon find it hard to put the book down. You’ll wonder what links all of the narrators together and discovering this is part of the enjoyment of reading the story. Our narrators do have some connection with skin: the brother is pock-marked and spotty and collects books that are bound in human skin, the sister is pure and has illuminous skin, the doctor studies skin disorders and the nun spends her life abusing her skin through anorexia and scourging. My list here does not do the book any justice so please read it and see for yourself. londonchoirgirl ….I am fascinated as to your reason for only reading books by women…please tell us why!